So here I am on a rainy Monday evening inside China House, with English Breakfast (they ran out of camomile and earl grey, can you believe that? ), a tiramisu and a Vietnamese tart to keep me company. Oh and Shuey too of coz, though mostly we are keeping each other company only by our physical presence with minds in our own worlds. It's actually my 3rd visit here already; the most to any of the cafes around Penang. I think China House kinda has it all. From casual breakfasts to quick lunches to cozy teas to fine-dining dinners, you can do all that here. There are even different sections in this pre-war house that cater for the different needs. Not to mention rooms for private functions and a lounge area surrounded by all types of wine. And if you are the bookworm type like me, you'll like the back area where there are shelves filled with books and magazines for you to browse as you enjoy a cuppa and a dessert or two. Did I mention that they are quite famous for their desserts with an unusual tiramisu cake made with kahlua topping the list? I was here for lunch once and sitting right across the cake counter and my-oh-my, the tiramisu was down to the last piece in no time (there were like 4-5 pieces when I first sat down). For myself, I've tried their brunch of beans & lamb sausage with egg, toasts, and caramelized onion (very filling! ), their lunch of roasted chicken with vinaigrette salad (tasty), and their dinner of vegetarian spaghetti (done in a nyonya-ish way with bunga kantan or ginger flower; an interesting recipe) and chicken mushroom pie (what you'd expect of a pie except it was on the house *yay). There is also an upstairs gallery where artworks of local artists are on display for sale so one can have a quick look-around after their meals before they leave. Interestingly, China House has two entrances, each facing a different road so the building is actually a combination of 3 heritage buildings. I've yet to explore till the other end entrance but right in between is an open-air courtyard with greenery but also an empty pool. My thoughts, if they spruce the place up with better landscaping, it could do wonders. 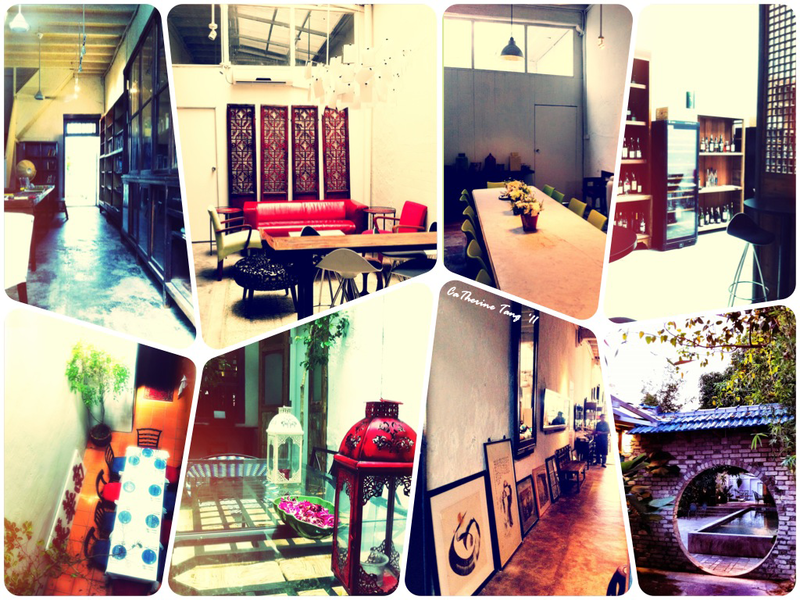 Updated Nov 10th, 2011: Apparently China House is the new Kopi Cine relocated from the old place at Stewart Lane.